Actually I think it’s the same problem we have in general with the firehose of information we’re exposed (or expose ourselves) to on a daily basis. The struggle of where to apply our attention will only be resolved once someone develops intelligent agents to filter the bad stuff and alert us to the good stuff. Wish someone would hurry up and make those. That will be the ultimate killer app. So far, despite many users calling for content-based filters, solutions to block keywords or topics are missing from the vast majority of information spigots. The recent meme about FriendFeed noise points to the frustration of some people with an inability to manage what content hits their screens. The two comments above underscore this feeling. So what to do? I’d like to suggest that the semantic web might be a solution for down the road. The Semantic Web is an evolving extension of the World Wide Web in which the semantics of information and services on the web is defined, making it possible for the web to understand and satisfy the requests of people and machines to use the web content. At its core, the semantic web comprises a set of design principles, collaborative working groups, and a variety of enabling technologies. Some elements of the semantic web are expressed as prospective future possibilities that are yet to be implemented or realized. With HTML and a tool to render it (perhaps Web browser software, perhaps another user agent), one can create and present a page that lists items for sale. The HTML of this catalog page can make simple, document-level assertions such as “this document’s title is ‘Widget Superstore'”. But there is no capability within the HTML itself to assert unambiguously that, for example, item number X586172 is an Acme Gizmo with a retail price of €199, or that it is a consumer product. It’s that last sentence there that addresses the noise issue. How does a server know that part X586172 can be categorized as a “consumer product”? That’s where the semantic web comes into play. And how the noise can be controlled on FriendFeed. 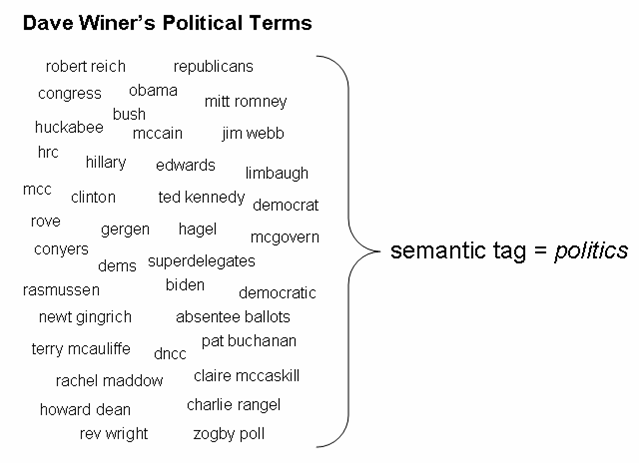 One way to think of the semantic web is as tagging on steroids. In the example above, part X586172 is tagged as “consumer product”. And the tagging occurs without human intervention. This is what’s needed on FriendFeed. The ability to take a wide range of terms that humans can understand are related. The relationship among the terms is tag. Now, imagine this in FriendFeed. Semantically-derived tags are appended to every item that flows through. Meanwhile, users have a new ‘Hide’ feature. Hide by topic. They could elect to hide streams with terms on a one-by-one basis. For instance, I’ll hide “robert reich”. I’ll hide “republicans”. I’ll hide “congress”. I’ll hide “obama”. I’ll hide “mitt romney”. I’ll hide…well, you get the picture. In addition, users could just hide all items with the tag “politics”, and be done with it. Simple. This could apply for all manner of topics: football, banking, Iraq, etc. 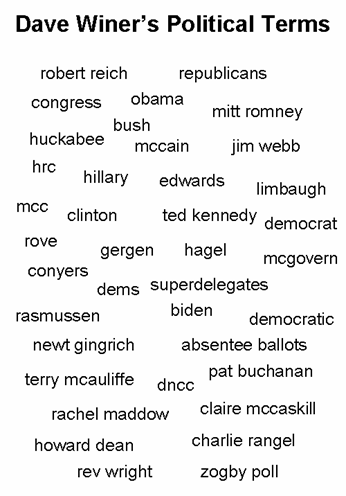 Just How Would These Semantic Tags Be Generated? I’m not sure anything quite with this purpose exists yet. Reuters has been a leading player in the semantic web with its Open Calais initiative. However, Open Calais focuses of its tagging on people, places, and companies. So if Open Calais was applied to Dave Winder’s FriendFeed stream would have a lot of tags related to those topics. But not metadata tags. We use natural language processing to analyze the data our customers put into their sites. Our datasets tend to be much smaller but are high quality since someone doesn’t add something to GroupSwim unless they want to share it. Then, we compare the language used in the content to other semantic sources including WordNet, Wikipedia, etc. to do our automatic tagging and analysis. Interesting, not sure what the tags they produce are. But it does give insight into a requirement: a core foundation of data against which all other data can be compared to derive tags. Something that would correctly map Obama and Clinton to a politics tag. I’m sure there are other interesting approaches. It’d be great if someone was working on something in this area. If anyone reading this knows of any semantic approaches that can apply metadata type of tags, feel free to leave a comment.